She may pull a perfect Louis Vuitton icon, but Madonna’s eye-unfriendly looks could scare anyone if the proper Photoshop filter isn’t generously applied! Madonna is in the menopause and keep on denying it. Poor thing. The oestrogene disappears from the fat in the flash. She trains too hard that’s not really wise or pretty! Of course you can go on with fitness and whatever but not on a body builder level like she does. Fifty is 50! Whatever you try….I know prettier women that age. What a freak she has become…..
P.S. Madonna’s hands has never been really her best features. I’ve always found them big and kinda men-ish. I’m sure she has bigorexia, she should visit her psychologist. All those poor rich and famous, surrounded by people that “obey and courages” them only for their own “good” greediness. She looks stringy and way harsh. She may be physically fit at all times but that is a tad over the top! OMG, she scares me. How have she changed? I’m sure this is photoshopped the other way around to make fun of Madonna and I feel a bit awkward now about my words. 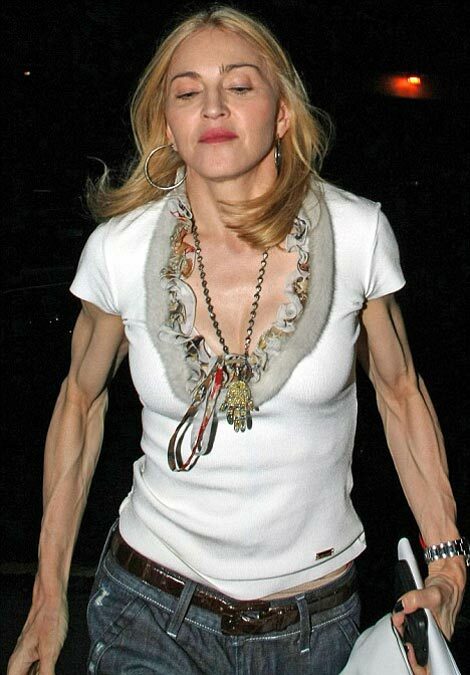 I’ve seen some photos from Madonna on stage and her arms looks over trained but not as the scary monster she’s here. This is not fair. It’s stinks and it’s mean. Bah! old women train alot to get muscles because they dont have anymore babyfat in their body to make their skin plump on their arms and legs and torso. they do it so that the muscles fill out their sagging skin. Dear kookiekandie, are you a girl? One day your skin shall sag too. To males happens the same by the way. That’s life. And it seems to be tough because the late great Bette Davis made this remark once in her really old days, Madonna is middle age by the way, but back to Bette Davis: “Old age ain’t no place for sissies”.